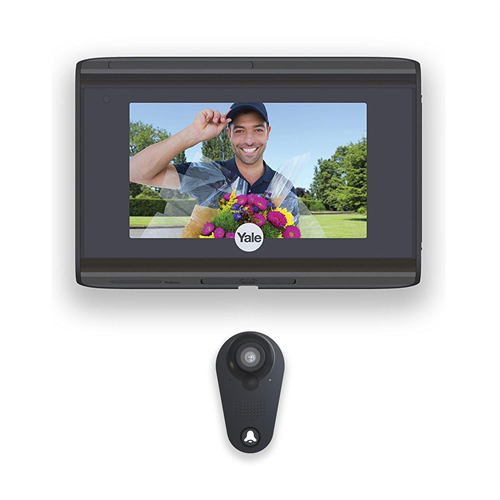 The YRV740-WI-693 is a Peephole Camera with LCD live view screen, built-in SD recorder for saving images, and built-in WiFi connectivity. When you're at home, use the LCD screen or a local smart phone to see who's at the door. Unlike a traditional peephole where people can see when you come to the door, the door viewer won't give it away. When you're away from home, use the free Yale iOs or Android app to see who's there, answer the door, and have a two way conversation with the visitor from virtually anywhere using your Internet connection. 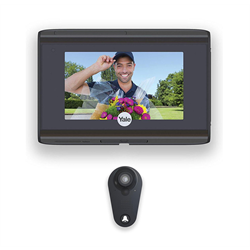 The Peephole viewer has a built-in doorbell button as well as a motion sensor to catch activity when someone approaches, or when the built-in doorbell button is pressed. Installation is simple and an existing peephole can be replaced in minutes with just a screwdriver. The LCD monitor features a wide-angle view so you won't miss anything. The Look is also able to store up to 5000 images on a microSD card which can be then viewed through a timeline feed to see all of the activity from your front door. Requires 9/16" Peephole. Some older doors may need to have the peephole enlarged.